Yesterday I decided that I wanted to make a summer cardigan. It's going to be one of those relaxed loose-fitting numbers. I'm going to use some wonderful Costa Brava Knitting DK Bamboo in Sandy Beach, and I'm searching around for a nice openwork pattern that will work well with the variegated wool and the summer vibe that I'm hoping to channel. 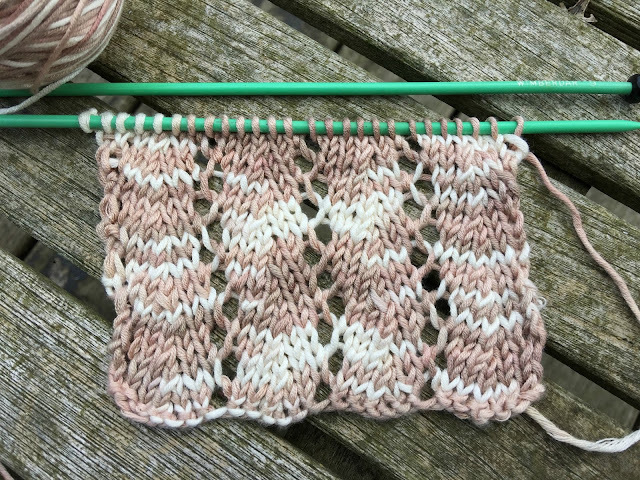 One of my favourite parts of searching around for a new design is the bit where I get to play and try different stitch patterns with the yarn that I'm proposing to use. With the sun beating down through the glass roof of the conservatory yesterday afternoon the WonderDog and I enjoyed a merry old time playing or knitting sample squares to see how things turned out and to check my tension. I'd got a stash of Radio 4 podcasts to listen to, the child was elsewhere at a birthday party and it was the very best sort of me-time imaginable. I'm taken with the vertical lines that the openwork stitch creates, which will hopefully be figure-flattering when we're all done. It's an easy pattern, which repeats over 6 stitches with an edge stitch on either end of the row and works through the pattern over 4 rows. Row 1 (right side): Knit 1 (K1), * Yarn forward - i.e. move the yarn to the front side of the work facing you and it will automatically create a new stitch when you knit the next stitch (YFWD), K2, Knit 2 together (K2 tog), K2*. Repeat from * to * to last stitch, knit 1. Row 3: K1, * K2, K2 tog, K2, YWFD*. Repeat from * to * to last stitch, knit 1. I've now committed and cast on the stitches for the back of the cardigan. I'll keep you posted on my progress.